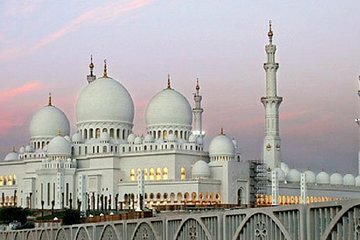 Visit two icons of Abu Dhabi — the spectacular Sheikh Zayed Grand Mosque and thrilling Ferrari World — on this full-day trip from Dubai. Travel to the UAE’s glittering capital city, and take a guided tour of the modern Grand Mosque, a vision of white marble domes, minarets and courtyards. Learn about its history and design, and then move the pace up a gear with a visit to the stunning Ferrari World indoor theme park. Enjoy ample time to experience the race-themed rides and attractions at leisure before your return to Dubai. After hotel pickup in Dubai, enjoy the desert views as you venture south to the UAE’s capital city of Abu Dhabi. As you travel, listen to your guide share information about the city and its rise to prominence during the 20th century. On arrival, admire the gleaming glass towers that dominate the city, and stop to visit the Sheikh Zayed Grand Mosque, one of the world’s biggest mosques, with a capacity for an incredible 40,000 worshippers. Head into the complex with your guide and marvel at the scale of this modern marble masterpiece, with its 82 domes and exquisite arcades, minarets and courtyards. Stroll around the terraces and visit the gargantuan main prayer hall. View the sumptuous decor and admire two of the centerpieces: the world's largest hand-knotted carpet and one of the planet’s biggest chandeliers. Afterward, continue to Yas Island, the island entertainment complex that plays host to Ferrari World. Show your entrance ticket and enjoy several hours to experience the exciting rides and attractions, all themed around the iconic Ferrari marque, at your own pace. Scream around the high-speed Formula Rossa coaster, hold tight on the high-looping Flying Aces coaster, steer a car through the virtual Italian countryside on Benno’s Great Race, watch the kids drive miniaturized Ferrari cars, and much more. When you need a break, refuel with meals and snacks (own expense) at any of the fun restaurants and cafes, and browse the Ferrari-inspired gift shops. When the time comes, relax on your ride back to Dubai where your tour ends with a hotel drop-off. The tour was ok. The places were great, company and driver not so much. It was a hour drive to Abu Dhabi from Dubai. There wasn't enough time at the Mosque. The 3-4 hours for Ferrari World was adequate because we were there as soon as it opened so the lines weren't long. The driver didn't talk much and was sleepy during the ride out to Abu Dhabi which could be seen in his driving abilities. What should have been a personal tour with my husband became a combined trip with the driver's girlfriend and her daughter. I didn't pay my money to share what should have been my tour with someone being on a date. I would never use this company or go on this tour again.